Fireman injured while putting out shop fire | Daily Express Online, Sabah, Malaysia. 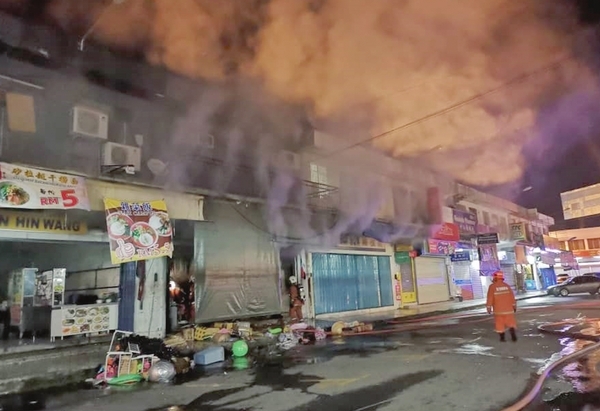 Kota Kinabalu: A firefighter sustained injuries after he is believed to have been exposed to electricity while putting out a fire engulfing 100 Mega Store in Lido Plaza, Wednesday. Personnel from the Emergency Medical Rescue Services (EMRS) acted swiftly and applied early aid as they rushed him to the Queen Elizabeth Hospital 1. According to the State Fire and Rescue Operations Room, the firefighter was reported to be recovering. He was among 24 personnel from the Kota Kinabalu Fire and Rescue Station led by Jamaludin Hussin who were at the scene after being alerted of the fire at about 12.44am. The team managed to bring the fire under control at about 1.03am and conducted thorough inspection on the premises to make sure there was no danger. The operations ended at about 4.22am. Meanwhile, a hawker near the area, identified only as Chin, was just about to start business for the day when she saw thick smoke coming from the premises around midnight. She claimed to have also heard explosions from the premises. Owner of the shop, Wong, said he only knew about the fire when the unit was already up in flames.